This past weekend was the Memorial Day holiday, traditionally marking the official start of the summer season. But Memorial Day is more than just barbeques with friends and three-day sales at local department stores. Memorial Day is also the day when we honor the more than one million men and women who have died in combat or from injuries received while serving in the US armed forces. Among those we honor are the nearly 75,000 who have died since serving in the 1991 Persian Gulf War (also known as Operation Desert Storm). Now, that number may seem surprising. After all, coalition forces suffered few casualties during the liberation of Kuwait. Less than 300 American soldiers were killed on the battlefield, and only 114 of those were caused by enemy fire. The rest were accidents or friendly fire. In the two decades since the Persian Gulf War, however, many of those who served (as well as many of the civilian contractors who supported the war effort) have been come down with a chronic disorder known as Gulf War Syndrome. Characterized by a diffuse set of symptoms -- fatigue, headache, memory loss, muscle pain and weakness, arthritis and joint pain, and respiratory problems -- the disease now appears to afflict over a quarter of a million Gulf War veterans, or nearly a third of those who served in Operation Desert Storm. Of those affected, activists estimate, over 70,000 have died. The disease itself is somewhat controversial. Several studies published in the mid-1990s found no evidence that those who served in the Gulf had increased rates of illness, hospitalization or death, at least when compared with veterans who served in other theaters of operation. Based on these and other data, in 1996 the Institute of Medicine (the clinical arm of the US National Academies of Science) concluded that there was no evidence of a unique chronic illness associated with military service in the Gulf. Despite this, and armed with an additional twelve years of data, in 2008 a federal panel known as the Research Advisory Committee on Gulf War Veterans' Illnesses announced that Gulf War Syndrome is indeed a distinct physical condition. The cause of Gulf War Syndrome is also unclear. Some blame exposure to Sarin gas or other chemical weapons stockpiled by the Iraqi government. 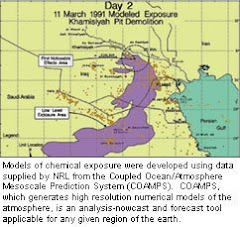 While there is no evidence that Saddam Hussein's troops ever used chemical weapons against the coalition forces, many soldiers may have been inadvertently exposed during demolition of these weapons during and after the war. 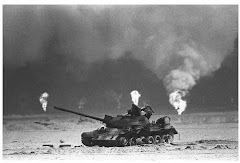 Others suspect that the cause of Gulf War Syndrome is exposure to organophosphate pesticides used to prevent the spread of insect-borne diseases common in the Gulf. Still others blame the pyridostigmine bromide pills given to troops to protect against nerve gas, or the depleted uranium ammunition used by troops, or the toxic smoke produced when Iraqi troops set the oil fields on fire. We may never know the cause of Gulf War Syndrome. This is particularly true since the US Veterans Administration (the VA) seems reluctant to study the disease or its causes. Doing so could put the Agency on the hook for billions of dollars in treatment costs. Not surprising then that the Agency is keen to prevent or suppress such research, at least according to testimony presented by former VA epidemiologist-turned-whistleblower Dr. Stephen Coughlin at a recent Congressional hearing. According to Dr. Coughlin, the Agency prevents VA-supported researchers from publishing "anything that supports the position that Gulf War Illness is a neurological condition." It also refuses to release data from the ten-year National Health Study of a New Generation of U.S. Veterans, a multimillion dollar study of nearly 60,000 Gulf, Iraq and Afghan war vets. Similarly, the Agency has also never published the results of the National Cohort of Gulf War and Gulf War Veterans study, a medical survey of some 30,000 Desert Storm vets. Finally, in an act that is either the height of hubris or the height of incompetence, the Agency "lost" over ten years of data from the Gulf War family registry, a Congressionally-mandated study to look for congenital disorders among the children of vets, birth defects that may have been caused by exposure to chemical weapons or other wartime environmental hazards. What's surprising to me that Dr. Coughlin's explosive testimony has not engendered more anger on Capitol Hill. His allegations that officials at the VA -- the very federal agency whose job it is to provide treatment and care for veterans and their dependents -- may have deliberately suppressed research into the causes of Gulf War Syndrome are shocking. This accusation deserves to be investigated and, if proven to be true, immediate action to correct the grave harm to those suffering from Gulf War Syndrome, those who have died of the disease, and their families. For 22 years now, sick veterans have been told that they are crazy, accused of being hypochondriacs, or denied benefits because their condition is not related to wartime service. It may turn out, however, that none of that is true. Rather, as has happened too many times before, the government may have sacrificed the health and well-being of military veterans in order to save a couple of bucks. That's not only shameful, it goes against everything those soldiers fought and died for. A public health researcher and ethicist by training, Dr. Sean Philpott is Director of Research Ethics for the Bioethics program at Union Graduate College-Icahn School of Medicine at Mount Sinai in Schenectady, New York. He is also Acting Director of Union Graduate College's Center for Bioethics and Clinical Leadership, and Project Director of its Advanced Certificate Program for Research Ethics in Central and Eastern Europe. Thank you Anthony for posting this very good piece by Sean Philpott. Sean has made some good points. "For 22 years now, sick veterans have been told that they are crazy, accused of being hypochondriacs, or denied benefits because their condition is not related to wartime service." Anyone who doubts this illness is the real thing is invited to spend 24 hours with me to witness me dealing with full body pain, swollen hands, tenderness everywhere, doubling over with abdominal cramps which is all too often followed by repeated diarrhea, sudden and intense headaches that have dropped me to the floor, often slowed and incoherent speech, repeated muscle spasms and, well, the list goes on and on. They can also look through my medical records and verify that my docs have treated me for symptoms alone because they can't find any traditional medical signs or symptoms of known illnesses or diseases. To think that the VA has possibly quashed the medical research that could have stopped us all a lot of suffering and even death makes my blood boil. It is downright criminal and those responsible deserve a public flogging. Literally and figuratively. "What's surprising to me that Dr. Coughlin's explosive testimony has not engendered more anger on Capitol Hill." I too am quite surprised by this. I have written lengthy letters to both my senators and my representative in the House as well as the House and Senate Committees on Veteran's Affairs. The only response I have received is from Senator Bernie Sanders (I-VT) who is the chairman of the Senate Committee. I don't know why the major news outlets have not jumped on this either. I would have thought that the anti-Obama right wingers would have used this as another bat to swing at the President's administration but even they have ignored this issue. Sadly, our numbers are too few and our war and illness has been overshadowed by the debacles that are OEF and OIF and the VA claims backlog. Which brings me to the question: why is it that if I had a leg blown off or lost an eye there would be endless sympathy and understanding but because my brain and nervous system are sick everyone thinks I'm crazy? I think that happens primarily due to a lack of education of the public about the disease and the VA is at the forefront of responsibility for that. To make matters worse, as ill Gulf War veterans, we have to fight for research funding, for legitimate public and government recognition of our dilemma and for benefits for our disabilities. Considering how much energy I have to put in just to get myself through each day not to mention doing everything I can to slow the decline in my health in the long term, it takes a tremendous amount of effort to battle the VA and public opinion. Some days its nearly impossible and I'm fortunate just to get out of bed. Thankfully there are some very good research scientists who continue to work tirelessly on our behalf and are making some progress with definitive findings. It is with this group of people who I rest my hope upon. There sure as hell isn't anyone else standing up for us.